In another signal of its intention to be the most trusted managed services organization in healthcare, Q Point Health (Q Point) has earned the rigorous URAC™ accreditation for credentialing providers. This demonstrates that Q Point adheres to the highest possible national industry standards when vetting a provider’s credentials to join a health plan’s network. Q Point is a division of Equality Health, which offers a provider network of its own that operates under a unique “culturally competent” model for delivering integrated healthcare. “I want to thank the Q Point team for all the hard work leading up to the URAC accreditation. We will leave no stone unturned in earning—and keeping—our reputation for undertaking the most thorough vetting of a provider’s suitability for any given network, including the Equality Health Network,” said Lisa Stevens Anderson, president of Q Point. The URAC accreditation is further proof that Equality Health and Q Point are committed to making the significant investments in compliance, IT security and HR training that strengthen payer-provider collaboration and integration; a fundamental need as value-based care shifts to ever more advanced risk and delegation models. This includes risk-based contracts for Medicaid and Medicare Advantage plans, whose beneficiaries include vulnerable and underserved populations. Here Q Point has core expertise and joins forces with the Equality Health Network to ensure only the most qualified providers serve these beneficiaries. After a thorough but efficient credentialing process by Q Point, Equality Health Network then provides practice management support and training in culturally competent healthcare, using its own unique, sustainable model. The entire process is designed to reduce historic disparities in care and access and deliver better outcomes at a significantly lower cost. “Q Point’s credentialing experts and efficient vetting process remove the credentialing burden that keeps good providers from getting on health plans faster. It also reduces the administrative burdens that too often stand in the way of what these providers do best—taking care of patients while maintaining the highest standard of quality and safety,” said Monique Delgado, vice president of Equality Health Network. Q Point intends to gain more accreditation credentials, with case management and utilization management as its next areas of focus. Additionally, Q Point is launching practice management solutions to help providers improve efficiency, sustainability, and quality performance. Q Point Health creates a collaborative bridge between managed care organizations and providers to deliver advanced risk-based payment and innovative solutions for delegation, practice transformation services, and scalable population health technology. Through a combination of software and services, Q Point Health’s Managed Services Organization platform allows providers to profitably assume risk; provides infrastructure for utilization management, credentialing and claims processing; provides financial depth for capitated contracting; and offers next-generation practice management solutions. For more information about Q Point Health, visit www.equalityhealth.com/solutions/q-point-health/. Equality Health, LLC is an Arizona-based integrated, holistic health care delivery system focused on improving care delivery for underserved populations with culturally-sensitive programs that improve access, quality and patient trust. Through an integrated technology and services platform, culturally competent provider network and unique cultural care model, Equality Health helps managed care plans and health systems improve care for diverse populations while simultaneously making the transition to risk-based accountability. For more information about Equality Health, visit www.equalityhealth.com or follow @EqualityHealth on Facebook and @EqualityHealth on Twitter. 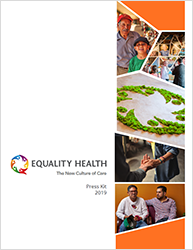 Equality Health is an Arizona-based integrated, holistic health care delivery system focused on improving care delivery for underserved populations with culturally-sensitive programs that improve access, quality and patient trust.